The letter from Ofsted following the inspection can be seen here. You work to provide a rich education that aims to engage the imagination and allow for individuality and creativity. National tests (SATS) in Reading, Maths and Grammar, Punctuation and Spelling to assess each child’s attainment and standard. Writing is assessed by the team of Year 6 teachers in school using each child’s work over the year and their judgements verified by external moderators. Teachers use national tests and a range of child’s work over the year, to make an overall assessment of attainment and standard. 2014 – 2015 funding for Woodbridge Primary School is £60,000 below Suffolk median for a primary school of 220 pupils and almost £140,000 below the National median for a primary school of 220 pupils. 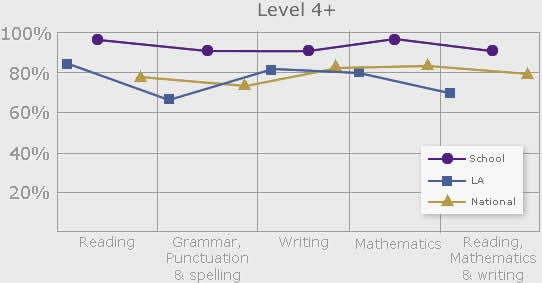 The Level 4+ graph illustrates how many pupils achieved level 4 or higher in the 2014 SATs examinations. These results are shown in comparison to the local authority average and the national average. 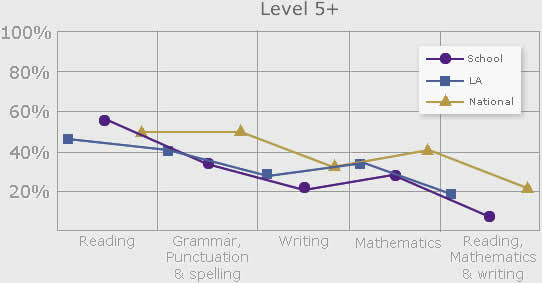 The Level 5+ graph illustrates how many pupils achieved level 5 or higher in the 2014 SATs examinations. These results are shown in comparison to the local authority average and the national average. 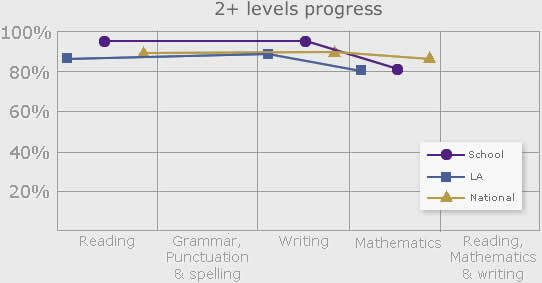 The 2+ Level graph illustrates how many pupils achieved two or more levels increase in the 2014 SATs examinations. These results are shown in comparison to the local authority average and the national average.